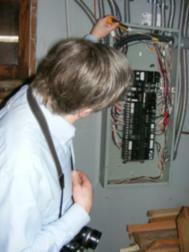 Seattle Home Inspector's Blog: My electrical panel has no main breaker---is that a problem? My electrical panel has no main breaker---is that a problem? The simple answer to this question is, "Probably not." It might be---but because most electrical panels are NOT installed by homeowners or handy persons, it is actually pretty rare to find a main panel with out a main disconnect. There are a couple of ways where it might "appear" that it is missing---but is in fact there after all. My goal is to keep this post simple enough that even the highly unelectrifed reader can understand what I am talking about. Real estate agents need to understand the basic principles so that when the inspector call for replacement of what appears to be a perfectly good panel, you can understand why. The first point I will make is that ALL electrical services to the home MUST have a means of shutting off all the power. Being able to shut off all of the power is usually achieved by a Main Disconnect Breaker in the electrical service panel---and should be labeled as such. (I am not going to talk about fuses in this post). Where it gets a little confusing is when that main disconnect breaker is in a different location from the panel in the home---like outside the home at the electric meter (as in mobile homes, townhouses, condos and other instances). In these instances the panel in the home is not the main service panel but is instead called a sub-panel or remote distribution panel. This type of panel doesn't "require" a main breaker unless it is in a detached structure. Of course it does no harm to have one and it is done sometimes for added convenience. The following picture is of a pretty close to correctly wired sub-panel. As a Seattle Home Inspector I love finding panels this nicely wired. This type of panel will not usually have a main disconnect---it will be located at the service meter panel (typically). There is another type of panel that looks, at first glance, like it might be missing a main breaker. This type of panel is configured such that it takes a maximum of 6 throws to shut all the power off. This type of Main Service Panel is called a Split-Bus Panel. The following picture is of a typical split bus panel with its dead-front cover in place. Notice it says, "Service Disconnects" in the center between the upper breakers? This means that when all those top breakers are turned off---all power in the panel will be off---including the lower breakers. The next picture is of a split bus panel with the cover off---notice how much it looks like the sub-panel picture above (well except for neatness)? What is different can best be described by showing the picture with descriptive overlays. The blue dotted lines are where the power coming into the panel attach to the bus bars. Note that the top six double pole breaker spaces are outlined with blue dotted lines and are numbered 1 through 6. Note how the wires from breaker #2 travel down behind the six spaces and attach (trust me) to the bars for the bottom breakers highlighted in red. Notice also that some of the double pole breakers in the area labeled "Service Disconnects" have been changed to single pole breakers---violating the 6 throw rule. This is common with these panels as more circuits are desired and there just isn't room in the panel for any more. Here is another panel with only three double pole breakers in the top six spaces but one of them has blue wires that run to the bus bars for the lower circuits. In this case it only takes three throws to shut off all the power in the panel---still well under the 6 throw rule. These panels were common into the early 70's and I still find them very often. Most panel manufacturers made such panels----and in many different versions. The code allowed for this type of panel as long as all the power could be shut-off in 6 throws or less---known as the "6-Throw Rule." Inspectors sometimes mistake these split-bus panels for sub-panels and incorrectly call for repairs to the way they are wired. I don't want to go into the differences between how main panels are wired differently from sub-panels, but just understand that they are wired VERY differently and it important for the home inspector to know these differences. These panels are often crowded and no longer have ample space to accommodate modern wiring requirements. Most of the time I am recommending to my buyers to upgrade these panels. Often the size of the service itself is adequate for the house---the panel just lacks to space to add new circuits. Replacing just the panel is almost always going to be considerably cheaper than an whole new service to the home. great post. panels are always a home inspectors point of emphasis. me, I stand back and watch. Charlie, you do the inspections and I'll take the bus home. Hey Charles, great explanation of a split bus panel. I'm sure there are plenty of home inspectors who would appreciate this kind of info. You should submit this blog as an article for the ASHI Reporter; they're in need of good technical articles. By the way, you mentioned "In a split bus panel there will be a section for "6" double pole breakers"... that might just be a regional thing. Here in MN, split bus panels will often have a mix of double and single pole breakers to make up the six. Glenn, would that be the "magic bus?" Reuben, maybe---I would hope this is pretty rudimentary stuff for home inspectors. Much harder to explain to the uninitiated:) You many be right about the regional thing. I have never seen a panel that didn't have it set up for 6 double poles. I have seen lots of time where they were not used though and still maintained the 6 throw rule using some single pole breakers. Great blog, even I understood that ; ). Like you I see split bus panel fairly often. I also see distribution (sub) panels wired as mains like you eluded to. Charles, thanks for the electrical education...Always enjoy your posts...Enjoy your day. The last few insepctions I have seen more split-bust panels than plain old mains. Steve, I had one today. Thats interesting stuf there Charlie and I even understood it. It's actually a great blog, very clear and well done. It had to take time to put together. I've hit suggest so more will see it. And I learned something, because I've never seen a split bus panel. Not in 35 years of construction or 5 years of inspection. Never heard of the 6 throws rule but I can see the logic in it. It may be a regional or jurisdictional thing. I've lived and worked in 3 provinces and one of the territories (eastern Arctic) so there was a reasonable chance of running across one if they are around. Robert thanks---It hink that this type of panel may be absent from some jurisdictions---but in Washington State they are all over the place. The wire nuts are fine---afterall the panel is nothing more than a giant junction box. Charles, you lost me at "My electrical panel..."
Just kidding, very informative for for those of us who "dabble in the trades". Yes, this is supposed to be rudimentary... but I'm sure there are plenty of home inspectors out there that don't have split bus panels in their area, or don't have many of them, so this might be helpful. It sure wouldn't hurt to offer; send Sandy an email to find out. I had a new construction a couple of weeks ago and could not find the main shut off in the panel. I had not been outside and when we went out there it was under the meter, and uncovered! The little metal door had not been installed. Odd to say the least. But I say this as a highly unelectrified reader. And Reuben's comment about the regional thing is very interesting also. I have often wondered if I could move somewhere else and do inspections! That's interesting about the wire nuts. Here they are not allowed in a fuse, breaker or switch panel with exposed bus bars or blade knives. The concern is a wire can loosen and external actions on the circuit cables can cause motion in the panel wires leading to arc shorting and damage in the panels. This can make the panels electrically hot and dangerous to open, requiring power sbe shut off externally to the building. So here any loose wiring, any abandoned wiring and any joined wiring in these panels is not allowed. All joints have to be done in an octagon or other covered box outside the panel and only then run into the breaker panel. All wires that enter the panel have to terminate at mechanically attached breaker lug / screw, bus bar clamp or grounding clamp. It just goes to show you that even though we all work with the same basic code reference, how those codes are interpreted and enforced is the greater factor. Jay, I am sure that there would be a huge learning curve for any inspector moving to another erea and why it is so important to be educated locally when becoming a home inspector. Good explanation of split bus panel. I can not ever recall seeing one here, which lends more credence to the regional thing. Jim, there are lots of regional things when it comes to home inspecting and exactly why any kind of "national" standards of practice is a bit silly. Not too many split bus panels here in San Diego. Good explanation Charlie. at the very top left you have a picture of a circuit breaker. This looks exactly like what I have. My problem is that the switch part that says on/ off isn't there now. Well, it is still there but its like the part you would throw the switch with is gone. it says on but there is nothing to grab and hold on to if I wanted to cut it off. I know that in the past I have used it to cut off the main power but now it just looks like it broke off or something. Any ideas? Ok I have a big problem I'm renting this house and I took pictures of the electric wires in basement I'm not sure this is safe .. I just got the home inspection on a place I wanted to purchase and it says needs to be evaluated by licenced electrician for safety as there is no main breaker. Should I bother spending that money or pass?